AGS Stone can assist you with vanity cabinetry, countertop and tile selections. We’ll help you create a stylish bathroom that is both functional and relaxing while not overspending. We can also recommend a reputable licensed contractor to perform services that we are not licensed to perform including electrical, plumbing and structural modifications. We enjoy an ‘A’ business rating with Angie’s List. Please contact us today to schedule a design consultation. Choose a sink that works best for your particular space and appeals to your sense of style. 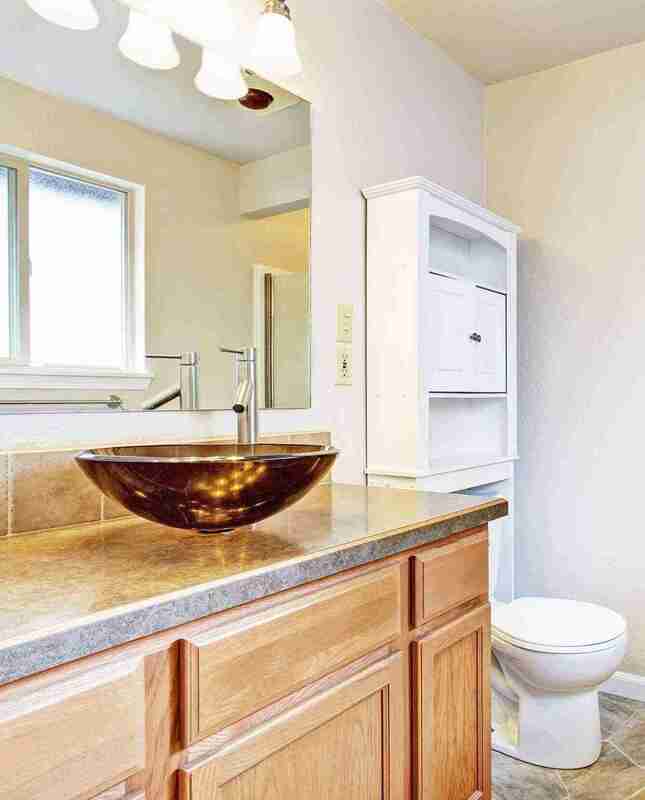 Researching a bathroom sink for your next remodeling project can be both daunting and fun. AGS Stone is here to help evaluate all of your options before committing to a selection. We have many sink options like this wall hung sink. It saves space and can be mounted directly into the wall at any height! 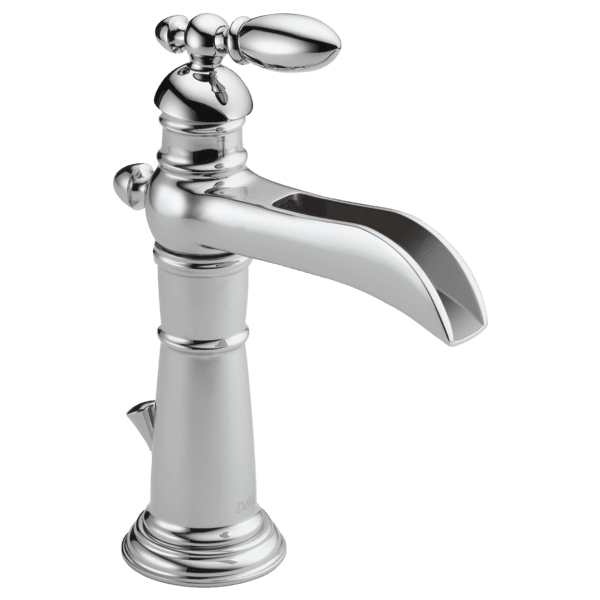 One design element that should not be overlooked when selecting the key components of your bathroom makeover are faucets. 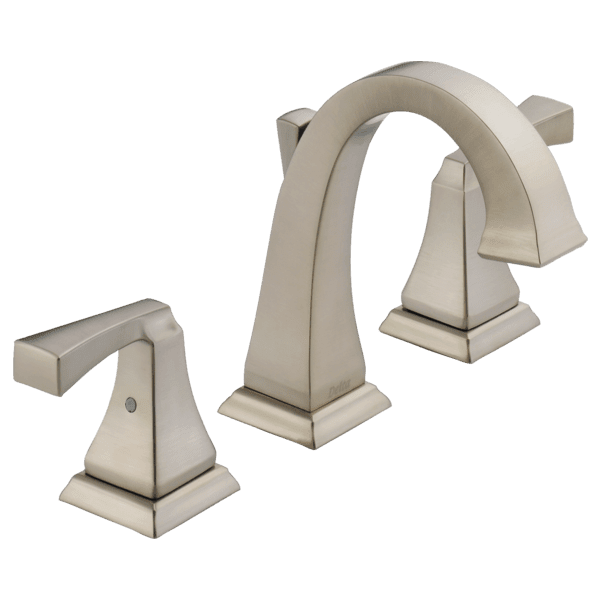 There are a variety of faucet types and finishes to choose from. While style and cost are often deciding factors, make sure to consider life expectancy. We have selected Delta Faucets as our business partner due to their recognized quality and breadth of product. 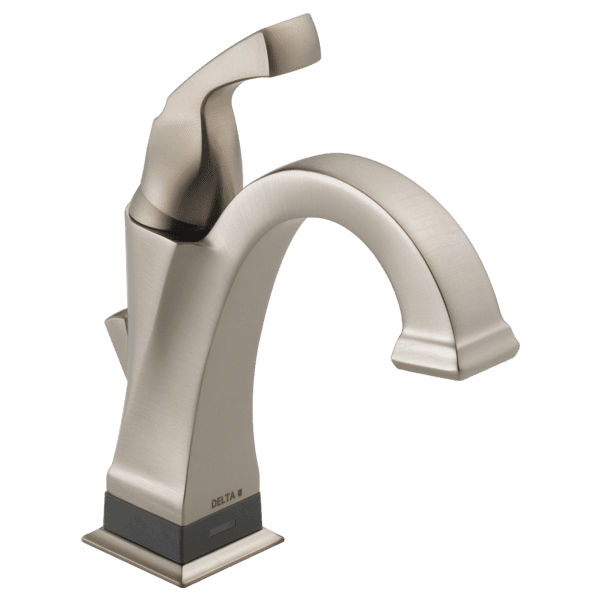 Remember that not all faucets and sinks work together and therefore, it is important to consider your sink and plumbing connections when making your selection. Consider your options. 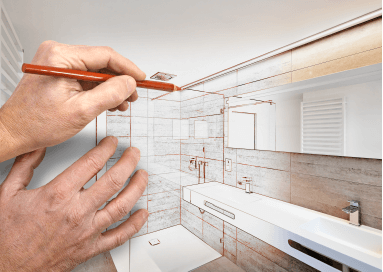 There are many things that you should consider before purchasing a bathroom vanity cabinet including the amount of space that you have to work with, the amount of storage desired and the cost. 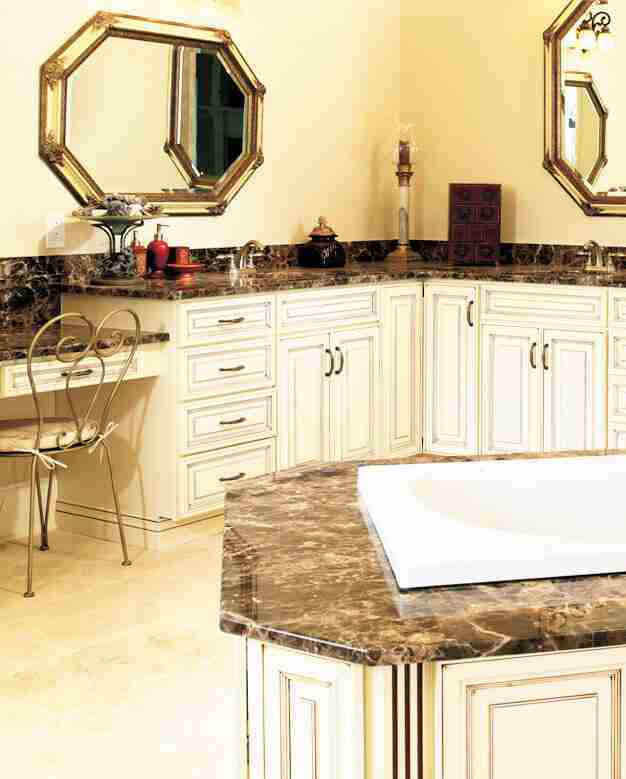 When choosing a vanity you should consider the size of the bathroom in which the vanity will be placed. Smaller vanities will make the bathroom more open while a large cabinet style bathroom vanity will allow for more storage space. 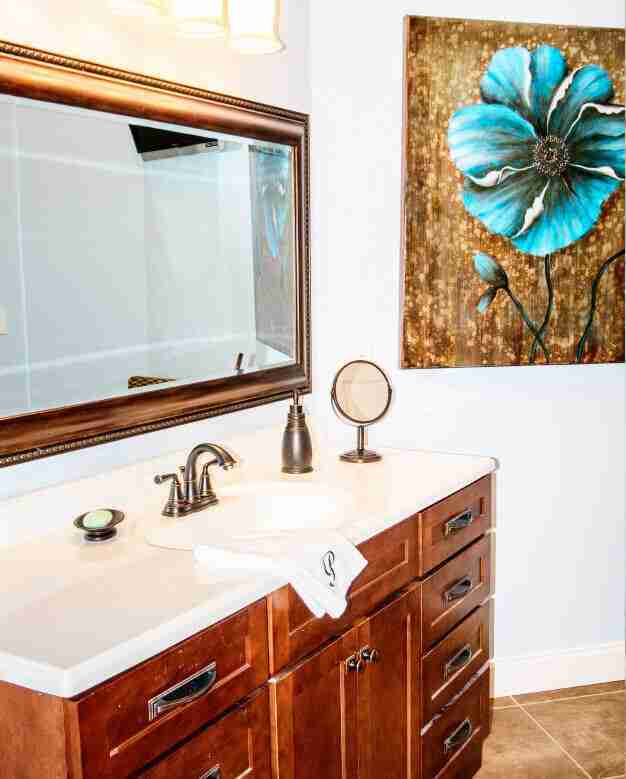 Cabinet style vanities are typically 21” in depth and range from 32” to 36” in height including the countertop. Sink base cabinets often have working doors on the bottom and a false drawer front on top. 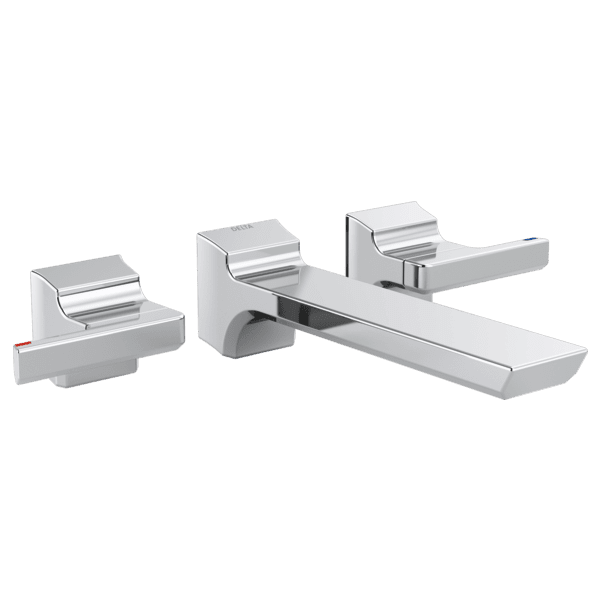 Two sink installations will require two sink bases and may also incorporate one or more drawer bases depending on available wall space and the location of plumbing connections. Like kitchen cabinetry, vanity bases can be selected in a variety of door styles and finishes. To add additional storage space while creating a distinctive look, tower cabinets may be installed on the countertop along with crown molding to create a finished look. For small bathrooms, the furniture style vanity is a great option because they tend take up less space. They are freestanding and designed to look like a piece of furniture. 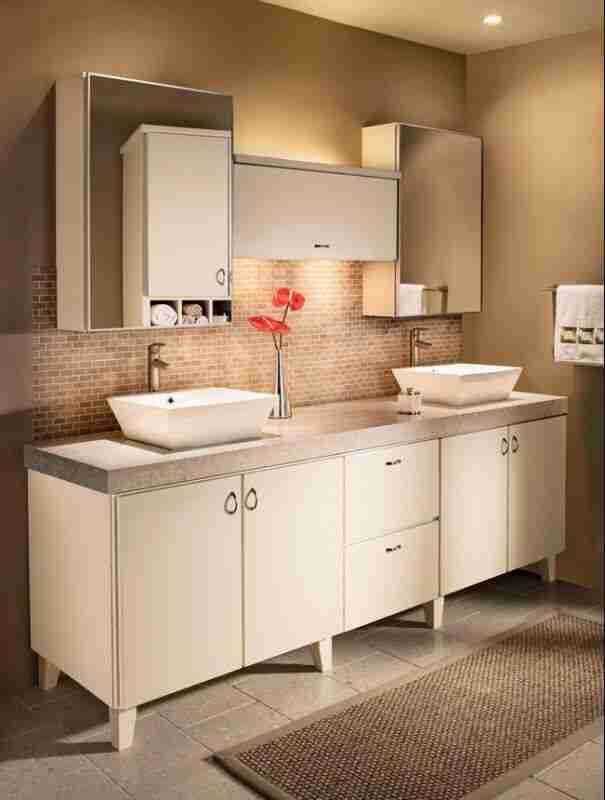 Furniture vanities may offer a quick and easy way to upgrade your bathroom without having to make dramatic changes. There are many vanity styles to choose from including those with large amounts of storage space and others that offer unique design elements. A vessel vanity features a freestanding base and a sink that is usually in a bowl shape which sits on top of the base. 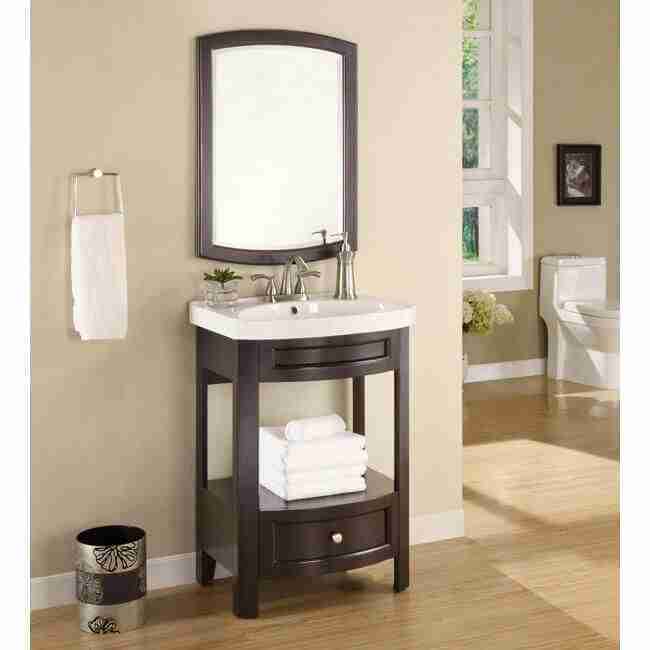 The vessel type vanity is perfect for small bathrooms that do not have a lot of extra room. Removing an old cabinet style vanity and replacing it with a vessel style vanity will allot more room to the bathroom making it feel more comfortable. Vessel style vanities are also artistic and very distinctive adding a sense of style to the bathroom. The Schluter®-Shower System is an integrated family of products that together form a fully bonded, watertight assembly for tiled showers. Unlike shower pan liners in conventional assemblies, bonded waterproof membranes, such as Schluter®-KERDI, bond directly to the mortar bed and protect it from becoming saturated with regular use. In addition, the KERDI membrane or Schluter®-KERDIBOARD waterproof building panel protect wall cavities from vapor penetration. The Schluter®-KERDI-DRAIN and Schluter®-KERDI-LINE floor drains provide a simple and secure connection to the KERDI membrane at the top of the assembly. Other components include the Schluter®-KERDI-SEAL-PS/-MV prefabricated seals and the Schluter®-KERDI-FIX adhesive/sealant, used to treat protrusions through the membrane, and the Schluter®-KERDI-SHOWER and Schluter®-KERDI-BOARD prefabricated substrates, which can reduce weight and installation time. The integrated Schluter®- Shower System eliminates leaks, reduces the potential for efflorescence and mold growth in the system, and dramatically reduces total installation time to ensure success and make shower installation easier than ever. New Design, We have Options! We offer exclusive financing options for our clients.